What does an environmentally friendly biodynamic food system capable of feeding everyone actually look like? A biodynamic revolution is sweeping India. HOW TO SAVE THE WORLD tells the story of marginal farmers across India who are reviving an arcane form of agriculture through the teachings of an elderly New Zealander many are calling the new Gandhi. The outcome of the battle for agricultural control may dictate the future of the earth. 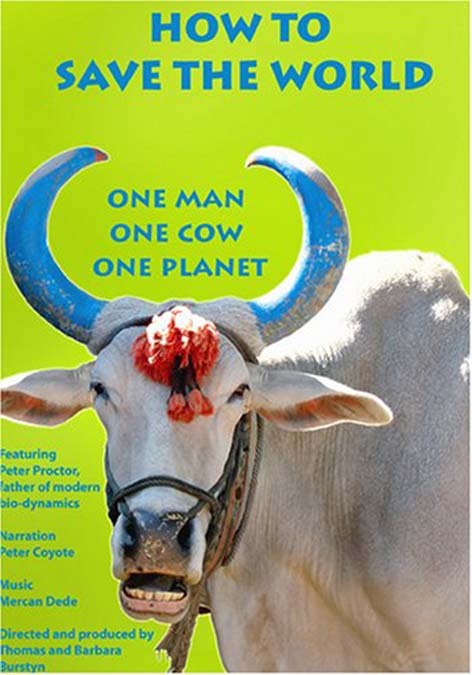 Narrated by Peter Coyote, Film 103 mins. After the film we will be joined by Adam McKinley, who will discuss his experience using biodynamics in the Willamette Valley and answer general questions on biodynamics. Adam McKinley has worked as a land steward and farmer at historic GeerCrest Farm, a local Non-Profit educational homestead, for the past three years. More recently, he has become involved with the Oregon Biodynamics Group. Adam also has experience annual and perennial production, as well livestock management, in Colorado and Hawaii. Categories: Uncategorized | Tags: abundance, Adam McKinley, agriculture, alternatives, biodynamic, biodynamics, community, compost, compost tea, corporate agriculture, Cow, earth, earth care, ecology, energy, energy saving, ethics, farm, farmer, fertilizer, film, food securtity, garden, gardener, gardening, Geercrest Farm, GMO, green revolution, herbacides, How To Save The World, India, industrial agriculture, living soil, local, manure, nature, New Zealand, NPK, nutrient rich, nutrients, One Cow, One Man, One Planet, oregon, people care, pesticides, Peter Coyote, Peter Proctor, salem, seasonal, soil, soil organisms, sustainability, sustainable, vegetables, water, willamette valley, world | Permalink.